I love great food and lovingly coaxed ingredients but I really believe you have to be in the mood to sit through a tasting menu of more than four courses. Mental preparation and patience is required and if you eat this way too often it can easily feel like hard work. So any venue sporting a stiffly quiet atmosphere, dragging tempo or uncomfortable seats is likely to have fidgety diners losing interest two thirds of the way. Fortunately those factors don’t apply at The Test Kitchen. So with all the hype created by local restaurant guides and international awards I tried to figure out why that is. You enter the creatively styled industrial venue and are immediately blasted by the noisiness of customers and a kitchen deep into service. The energy is palbable – chefs chopping, searing or plating from multiple ingredient containers at a steady tempo while waiters bump your chairs as they speed past. It’s oddly reassuring. In fact you’re rarely neglected for much of the meal, such is the standard and pace of service. And then there is food that wows. 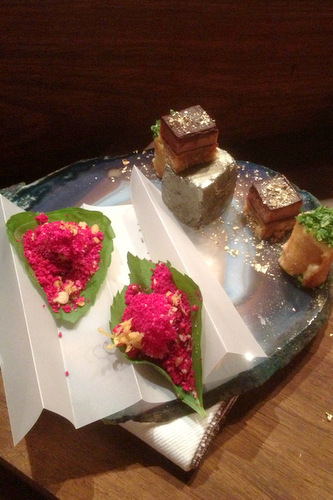 The nine-course gourmand menu grabs attention with a vibrantly coloured trio of snacks to start. The Billionaire’s shortbread is witty, mimicking its usual sweet caramel version with a melt-in-the-mouth shortbread square with dark chocolate capping a porcini and truffle jelly and duck liver layer. A herb-topped smoked mackerel parfait parcel roll combines creamy-salty smoked fish with citrus zing, while vibrant fuschia dehydrated pickled beetroot resembles nothing you know. Visually freeze-dried instant coffee granules come closest, their redcurrant-ish taste forms a zany combo with lemon jelly on a shiso leaf. It’s an ingenious touch as you can’t nibble without sitting to attention – it seems rude to ignore your food. 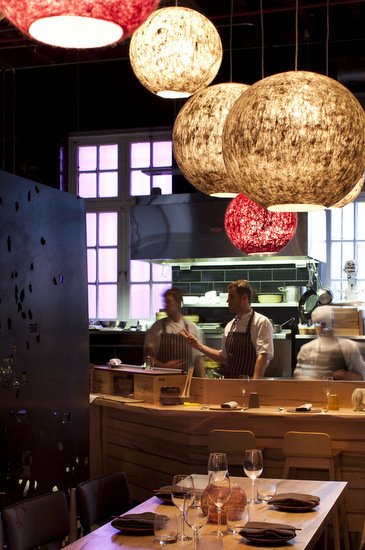 Chef-restaurateur Luke Dale-Roberts’ The Test Kitchen is arguably Cape Town’s most successful high-end dinner venue. The irony is that most of us eat out to have a break from domestic monotony, yet tasting menus mean conforming to a formula of sorts and being told on what to dine. 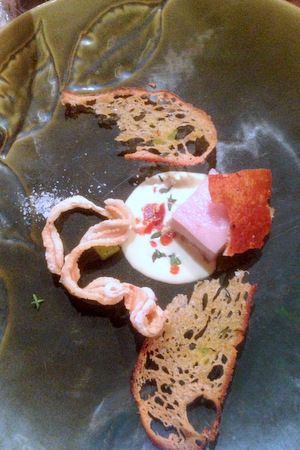 Such is this restaurant’s popularity that in October 2013 the three-course dinner option was dropped, and diners now order only the five-course discovery or nine-course gourmand menus. A vegetarian five-courser is available, and with sufficient advance notice so are nine vegetarian courses. People are consistently buying into and paying dearly for the experience. The current Test Kitchen menu was introduced in winter 2013 and head chef Ivor Jones (at Luke’s side since La Colombe days) says some standouts have stayed alongside lighter spring dishes introduced. Ivor was running the show the night we dined. 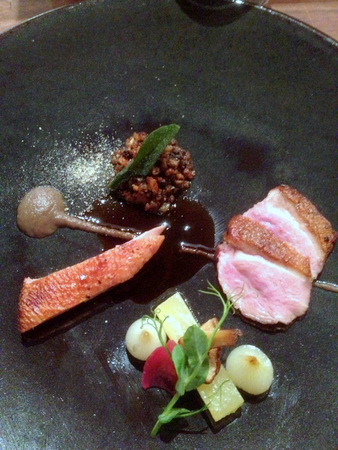 The African influences in dish concepts or ingredient input is fairly subtle – local veggies and macadamia nuts, Franschhoek trout and yellowtail, or the air-dried ham effect of ‘pulled biltong’ accompanying the foie gras. Take the inspired Cape-style ‘pickled fish’ dish which combined the most unlikely ingredients – yellowtail ceviche in a lightly curried dressing with, of all things, braaied carrots, pickled carrot ribbons and deep-fried crispy carrot strands. Simple. Understated. An aftertaste of cumin over an earthily sweet brown base, accented by the lean bubbles of Silverthorn The Green Man MCC 2010. You’ve probably heard about one African element: Luke’s sense of humour playing out in the rough-and-ready roasted pig’s head, his version of a toothy sheep ‘smiley’ shown to diners for shock value. The plated dish that follows combines a meticulous square of ultra-tender pig’s cheek fattiness alongside crispy crackling and deep-fried pork scratchings. Perfect pressed apples, herby melba toast and a gooey-rich creamy pool of blue cheese complete the plate – rich on richness that works. The Paul Cluver Dry Encounter Riesling 2013 served alongside cuts through fantastically. I’m not convinced the pig link with the Township sheep’s head ‘smiley’ translates to the many foreigners filling the reservation book though – my explanation seemed lost on the solo American woman also dining at the pass counter. Pete Wells makes a few good points about restaurants serving tasting menus recently in his October 2013 Nibbled to death article in The New York Times. 1. Three- or four-hour menus were a high-end anomaly a few years ago, but now look like the future of fine dining. 2. This is a challenge no chef should saunter into casually. A restaurant whose sole product is an expensive, lengthy, take-it-or-leave-it meal sets a dauntingly high bar for itself. But a few vault right over with a grace and agility that is truly thrilling. 3. If a meal goes on for hours, even radical costume changes from course to course may not be enough. They shouldn’t be repetitive or feel like padding either. 4. The elite who now fill these dining rooms are a particular kind of diner. One reason why these dining rooms can feel less lively. 5. You can’t eat a meal like this with a passing acquaintance since you’ll be together for hours, but you can’t go with somebody you really want to talk to, either, since there’s little time between courses for sustained conversation. Thinking back on dinner, all those factors are valid but The Test Kitchen delivers a smart take. We didn’t suffer a main-course slump. You know, an inspired series of earlier savoury and fish courses tailed by a skilled but predictable red-meat dish. Instead the ‘slow and fast’ duck, a cleverly amusing edible highlight. Sous vide slow-cooked duck in contrast to the crisply pan-seared ‘fast’ duck flesh, hinting at Sunday roast with base notes of duck liver stuffing and lentils, an earthy dab of burnt onion and thyme puree pulling it together with confidence. Who said food can’t simultaneously delight and make you chuckle? One of the things that makes great food stand out is the ability to build layers on just the right neutral base elements. Luke’s mastery of Asian condiments has always been his secret weapon, used with other ingredients in the subtlest manner. The way creamy pureed tofu is combined with miso so it doesn’t overwhelm the seafood juices and raw mushrooms in his scallop dish. A smear of ‘New York cheesecake’ that uses mirin alongside Franschhoek trout so the cream tastes not unlike horseradish mayonnaise, exploding on the palate with a bite of lemon jelly. Wells’ elite diners are certainly filling The Test Kitchen’s tables though. Within elbow reach were an animated couple from New Jersey, a good 25 years older than most. Dropped off by their five-star hotel and full of compliments, the husband confided that their meals at Per Se, Robuchon and Ducasse hadn’t come close to this gourmand menu experience in Cape Town. I’m sure the exchange rate helped. Overheard too was a Melbourne diner telling Chef Jones that service this good was rare in Australia. I was a media guest of the restaurant this time. We ate at the pass, and will happily request those counter seats for two again when paying with our own credit card. They’re fun, brightly lit and close enough to the chef plating the amuse to ask questions. This zoomed-in view of kitchen action is not the spot if you covet a romantic dinner or prefer to avoid the grittiness of staff wiping their hands on food-caked aprons and grimy cloths. And don’t expect to snag a table anytime soon if you’re bringing friends along. The Test Kitchen is taking bookings two to three months in advance. THE TEST KITCHEN, The Old Biscuit Mill, 375 Albert Road, Woodstock. Tel 021 447-2337, test kitchen. The five-course discovery menu costs R520 per person or R765 including wine pairings. The nine-course gourmand menu costs R650 per person or R1000 including wine.